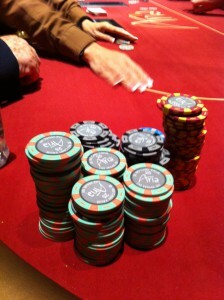 Played 2 tournaments, Venetian 12pm and Aria 1pm. Also 4 cash game session. Venetian, Aria, and MGM Grand. 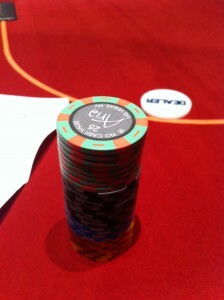 Early rounds – Ran 12K starting stack up to ~40K,. Dealt A/A, blinds 100/200/0. Raised 3BB, got 3 callers, flop A/K/K, top boat. Slow played bluff happy cowboy in seat 2. Check called flop. turn was 10. Raised bet from villian and was called. River K, Villain bet out and I call, just in case he has the case K. He shows A/7 and I take the pot. Also hit a flush over straight to chip up on the next level. Key hand: Blinds 400/800/200. 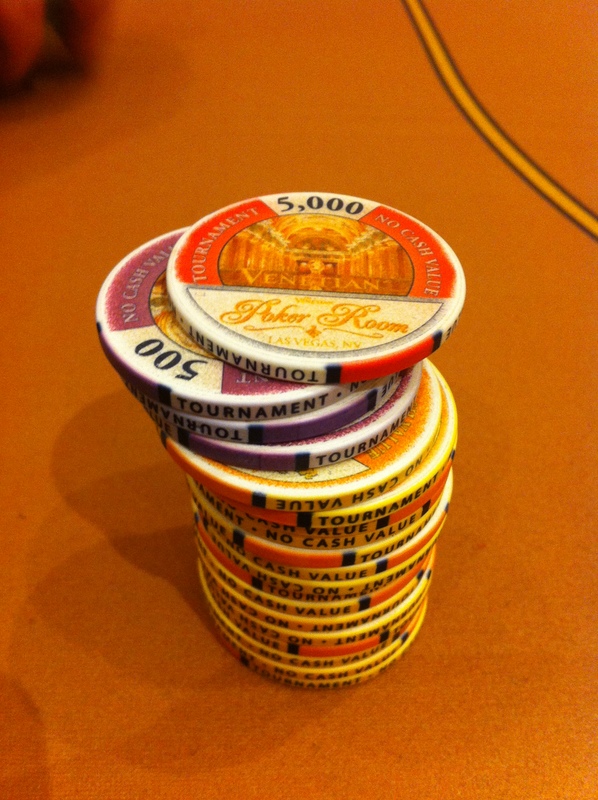 Stack about 38K. Dealt Tc8c, in the BB and was limped around to me, and check. flop was 9cJc8d. Villain to my left was short stack and pushing all in past 3 hands and doubled up on last hand. I semi bluff 1/2 pot with my monster straight, flush draw, with possible 2 pair outs as well. Villain moves all in again. Calling would put ~60% of stack at risk. I make the call, villain turns over A/J for top top. Did not hit any of my 20 outs and my stack is severely cut. Card dead and playing short stacked with escalating blinds, raised to 3BB with J/J with only 10 BB left. BB defended. All in on flop and BB hit his Q on the flop and out. Played on 2 different days. 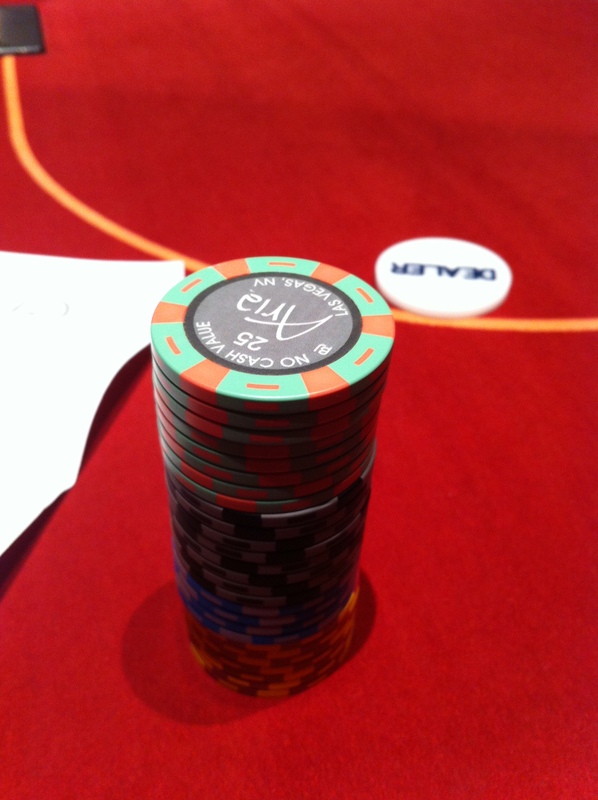 Day 2 – Played 4/8 Omaha 8/b with 1/2 kill. Game was full and had a must move, short handed feeder game. Played the feeder game for about an hour, then was moved to the main game which went short handed about 30 minutes after I sat down. Played short handed for another hour or so and the game broke. Overall down $150 or so. 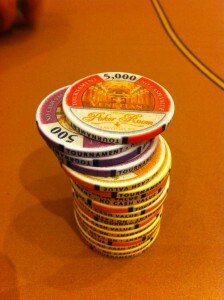 Played 1-2 NL Hold ’em in the morning and ran 300 up to 700 before cashing out to play Aria 1pm tourney. Great room with competent dealers. This room and the Venetian are the places to play. Started with 10K start and chipped up against maniac who was pre-flop raising 4-5X BB and playing almost every hand, and firing big on flop and turn. Got most chips on single hand with blinds at 50/100/0. Villain rasied to 450, defended BB with 4 callers holding 2/2. Flopped a set and slow played til river when I shoved all in. Ran stack to 25K or so. 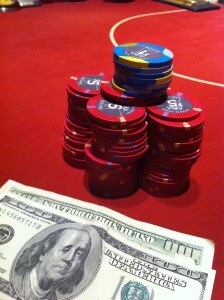 Then won an all in race against a short stack holding A/Q against 7/7, stack over 40K. Key tourney hands. Limped in with Tc6d in EP with 4 callers. New villian raised out of BB, and 4 callers. Flop was T high, villain bets small, folded to me, when I raise. Others fold, villain shoves all. Reading him for a draw and getting decent pot odds (villain was short stack and could be shoving light), I call and villain hits his straight (he also had bottom pair). Stack still healthy, got involved with another aggressive player in a large pot. Blinds 800/1600/200, defended 2.5xBB raise in the BB with suited connectors. Flopped a straight draw on a ragged board and called a large flop bet from villain #2. Turn was blank and got pushed off by large bet on the turn. Short stacked, blinkds at at 1000/2000/300 player to my left shoved with a little over 12BB, I shoved A/K with 10BBs, big stack at table calls. Player to left has A/A and SB has K/Q. and I’m out. All in all, a good trip. Basically bank rolled my tourney buy ins via cash games, so left even from a cash flow perspective. Venetian is by far the most player friendly for smaller stakes and the tourist, recreational crowd. They will spread any game as long s there is interest. Dealers are super fast and efficient and the tables are spread out so you don’t have that “packed in” feeling. Aria seems to be the place for mid and higher stakes games, especially at night. While the ultra high stakes are still at the Bellagio, seems like more action is shifting to Aria. Tables are more tightly packed than Venetian, but it’s not so much so that you feel super sardine packed in like the Bellagio can get.